Once upon a time, along the banks of the Zambezi River, a development project focused on tomato cultivation failed hilariously when just as they began to ripen, a herd of hippos devoured the crops. There’s an excellent TED Talk by sustainable development expert Ernesto Sirolli that explains the details, but the moral of the story was that the project managers planned it without consulting the local community,who would have told them what an awful idea it was. This story exemplifies a common critique of international development which made me wary of working abroad in the first place: the tendency to neglect the everyday knowledge, needs, and desires of the very communities affected by development projects. 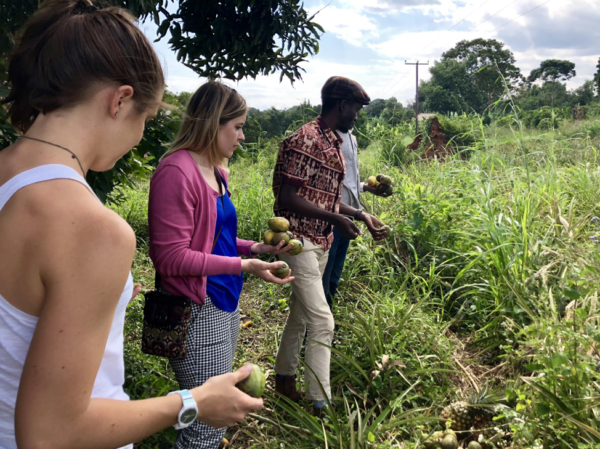 Summer fellows Emma Merrill and Kristi Kamesch, and coworker Rushongoka Wa-Mpiira picking mangoes and pineapples at Rural Community in Development (RUCID). When Emma, Kristi and I arrived at Open Impact Institute and met our coworkers for the first time, I knew this would not be a problem during my time in Uganda. Our supervisor, Rushongoka Wa-Mpiira, highlighted the importance of direct community engagement right away. 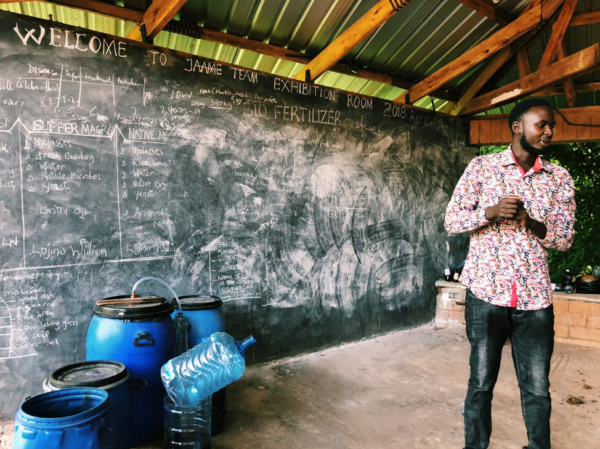 “In order to effectively promote sustainability, you have to first reach out to the farmers and communities most affected by environmental degradation and listen to what they have to say,” he told us. We did just that on our first site visit to Rural Community in Development (RUCID), an organic agricultural college that offers internships to university students and training services to small-scale farmers. The students were gracious enough to talk to us about their passions, work, and innovations, such as creating bio-fertilizer using locally available materials. RUCID students and staff explained some of their innovations in biofertilizer and other organic farming techniques. A few weeks later, we found ourselves on the shores of Lake Victoria at a conference for young African leaders. The Young & Emerging Leaders Project provides a platform for entrepreneurs, innovators, and community organizers to come together and learn from one another. We met a woman who won a hard-fought battle for the right to publicly protest increasing gender-based violence in Uganda, a quadrilingual 24-year-old who co-founded an organization for peacebuilding in Burundi, and more than a dozen other thoughtful, passionate young leaders already hard at work to improve their communities. We were also introduced to the Business Innovations for Good’s OpenEd Fellowship, which provides mentorship and skills training to agribusiness entrepreneurs. My main project this summer was interviewing the program’s alumni to understand how their lives have changed since participating in the fellowship. Utilizing the business training they received, 40+ fellows have designed and developed a range of programs including an organization encouraging youth participation in agriculture, a natural beauty products business, and Afrigal Tech, a project using mobile technology to simplify sickle cell diagnosis. 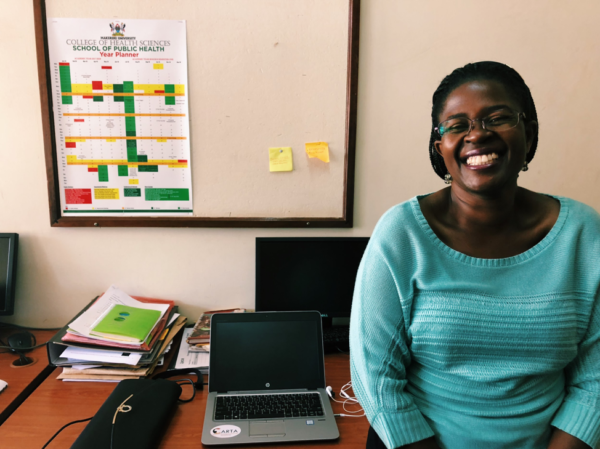 At one point, I spoke with OpenEd fellow Florence Tushemereirwe, a public health Ph.D. candidate who developed a porridge that reduced malnutrition by 50% in one district. Ms. Tushemereirwe made a major impact on those communities, and then used the skills learned in the fellowship to launch her own business producing the porridge. She has since expanded the company’s services to animal feed production and manure processing. I walked away from the interviews inspired by the fellows’ creativity, generosity, and dedication to their work. Florence Tushemereirwe, a public health lecturer at Makerere University and an inspiring leader in food security and nutrition. From the mango groves at the Open Impact Institute to the communities we visited, I witnessed a sense of community support that I hope to carry with me in my future work. 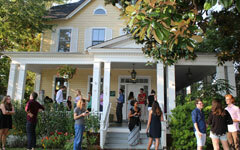 Every interview, site visit, and conversation I had reflected the importance of collaboration. In my interview with Florence, she said to me, “You can’t do the things alone. You can’t solve community problems alone.” From the rolling hills of Kampala to the swampy marshlands of Williamsburg, I feel grateful to have met people who remind me I don’t have to – there is always an inspired network of supporters.